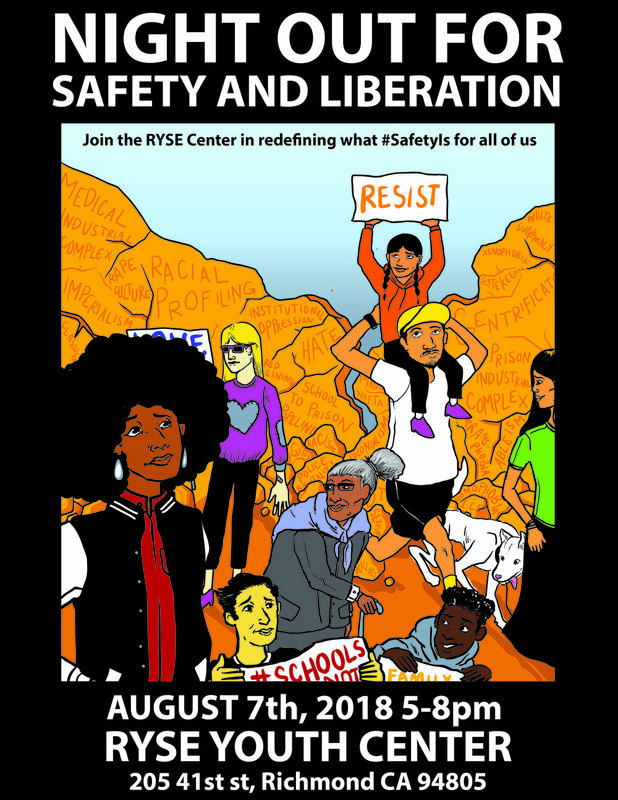 Learn more about Night Out for Safety and Liberation here. Join the RYSE Center in redefining safety beyond fear, punishment, policing, and incarceration. This free community event features art & performances, resources, family-friendly activities, food, and fun! Come break bread, connect with neighbors, friends, and family, and join the conversation on what creates safety — from quality jobs to racial justice, gender justice to youth empowerment, immigrant rights to affordable housing and beyond. It takes a village to imagine what #SafetyIs for all of us — a village to build dignity, roots, power, and beloved community. WHO: This is an open community event that welcomes all ages to envision a safer, thriving, empowering Richmond. Únete con RYSE Center y ayudanos a redefinir lo que la seguridad significa para todos nosotros. Únete a RYSE Center el Martes 17 de Agosto y ayudanos a redefinir seguridad más allá de miedo, castigo, vigilancia policial, y encarcelamiento. Ven y disfruta: comida, recursos, música y actuaciones, actividades para toda la familia. Tambien habra diálogo comunitario sobre lo que se significa la seguridad: Hablaremos sobre empleos de calidad, derechos de inmigrantes, viviendas asequibles y más!